Okay savvy gals, I am not trying to get us to spend more money during this economic slump but this deal is too good to pass. I am pretty excited so I just have to share about this. Which one do I really want or buy both since each is on sale for $88 from $180? The sale will end on Thursday, if you like Lauren Merkin, act now before you favorite color or style is sold out. If you are not a Gilt member yet, click here to join. These are pretty SG a great bargain and won't break the bank, I like the pink one and all the pinkness from your previous post, Kathy. Am I blind? I didn't see this today and I just logged on and I don't see them on the weekly calendar. Do some of us get different deals than others???? you know now emily. get it while you can. I know the brown is probably more practical, but I looove the texture and color of the pink one! I will get the brown one cause I am all for bags that goes wit every outfit! I would go with the one on the left. Just love the lines! 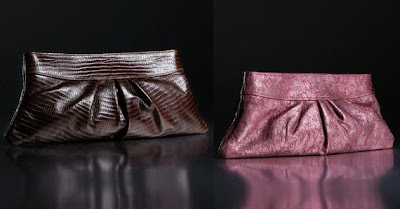 I love Lauren Merkin clutches!